Patients who have had kidney stones usually undergo some routine tests of their blood and urine to look for an underlying metabolic cause that may be contributing to the formation of stones. Occasionally a problem with the metabolism of Calcium is identified and this can usually be corrected. It may be associated with a small gland in the neck or in the amount of Calcium that is passed out in the urine. Usually dietary factors are not significant but in general, a good fluid intake (to keep your urine clear) and a healthy diet with no excesses will help prevent the further formation of stones. As many patients will know however, despite these measures stones, often recur. Stones causing a blockage to the flow of urine from the kidney to the bladder cause pain which most people know as renal colic. This pain can be quite severe and unrelenting and often makes people nauseated and sweaty. Smaller stones (less than 4mm to 5mm) have a high chance of passing spontaneously into the bladder and may not require intervention. Larger stones have a smaller chance of passing spontaneously and will usually require some form of intervention for them to be removed. 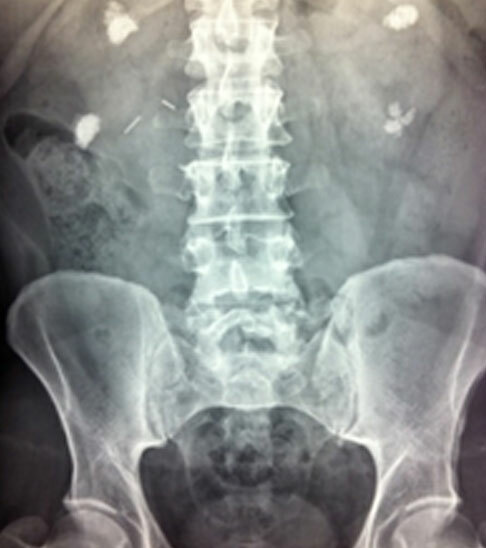 The pain of ‘passing a stone’ occurs when the stone pops into the bladder (as in the photo below) giving relief of the obstruction. Passing the stone out of the body often goes unnoticed if the stone is small and if the urine can be strained and the stone caught, it can be sent for analysis. Most stones are composed principally of Calcium and can be seen on plain X-rays as well as CT scans. These stones generally need to be fragmented into smaller pieces to remove them safely. A small number of stones are composed of Uric Acid and these stones may be able to be dissolved and therefore are treated without the need for surgical procedures. Uric acid stones can be prevented with the use of medication. Plain Xray showing large calcified stones in the upper and lower portions of each kidney. If these dropped into the ureter, they would cause blockage and significant pain. The pain from kidney stones is characteristically experienced in the loin or flank region and often radiates around to the front and may cause testicular discomfort in men. This may be accompanied by blood in the urine but this is not always the case. Once the presence of a stone has been diagnosed, treatment will depend on the position of the stone as well as the size of the stone. 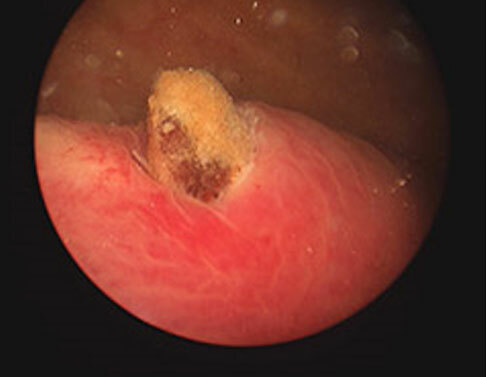 Almost all stones can be treated endoscopically i.e. with the use of telescopes passed into the bladder and into the ureter to fragment the stone with laser and remove the fragments. Stones in the kidney can also be treated directly with shock wave lithotripsy that shatters the stones allowing small fragments to pass spontaneously. Larger stones in the kidney can also be treated percutaneously by creating a track directly into the kidney and removing the stone either with or without fragmentation. Occasionally blood and urine tests can determine a particular cause for the formation of a stone but often no specific abnormality is identified and patients are advised to maintain a good fluid intake and a balanced healthy diet.